Janet Laurence is featured in Troubled Waters at the Anne & Gordon Samstag Museum of Art. 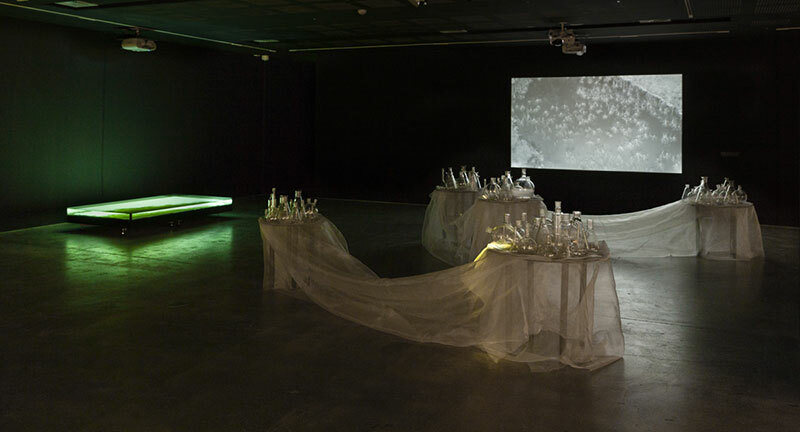 Troubled Waters is a UNSW Art & Design exhibition curated by Dr Felicity Fenner. Originally exhibited at the University of New South Wales, the exhibition will travel to Adelaide in late April. A major collaborative project between UNSW Science and UNSW Art & Design, Troubled Waters illustrates the complex ecosystem of rivers and oceans by tracing the Murray from its source at Corryong in Victoria to its mouth in South Australia’s Coorong region. Works by multimedia artists, in close collaboration with leading environmental scientist Richard Kingsford, bring environmental research into the gallery to poetically interpret information not easily accessed by non-scientific audiences. The exhibition features work by Nici Cumpston, Tamara Dean, Bonita Ely, Georgia Wallace-Crabbe, Richard Kingsford, Andrew Belletty, and Janet Laurence. Exhibition runs from April 28 to June 9. Image: Janet Laurence and Andrew Belletty, River Journey, 2016, multimedia installation based on the audio and visual research archive of Professor Richard Kingsford. Janet Laurence will also undertake a six-week residency at the Hanse-Wissenschaftskolleg (HWK) in Delmenhorst, Germany. As an international Fellow, Laurence will continue work on her research project Blood and Chlorophyll. My Heart Wears Flowers and Fruits in the Night, commenced late last year. The HWK promotes the disciplinary and interdisciplinary collaboration of internationally-renowned scientists and young investigators by offering guest scholars (Fellows) the opportunity to concentrate on research projects for a certain space of time without the distractions of their regular academic responsibilities. Laurence will undertake the residency from April to June this year.